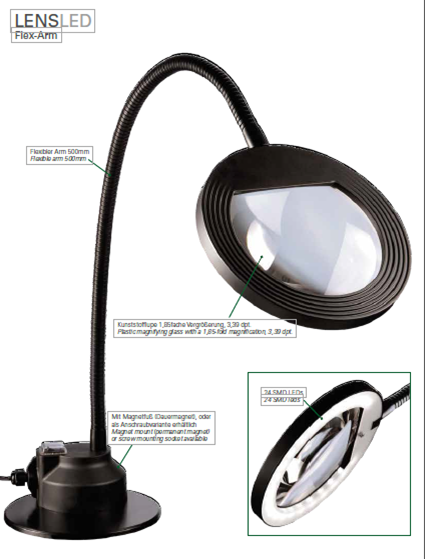 The LENSLED LED luminaire with flex arm comes with an inte- grated plastic lens for 1.85-fold magnification (3.39 dpt.). This qualifies the lens luminaire to illuminate work requiring extreme accuracy, such as in laboratories, in the watchmaking and jewellery industries or in electronics and metalworking. 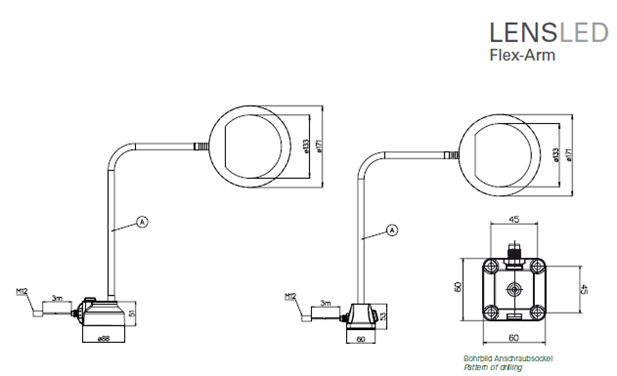 In these cases it is an advantage that the LED luminaire can be flexibly adjusted via its flex arm. 24 SMD LEDs of the latest generation (100 lumen per watt) ensure homogenous as well as glare and flicker-free lighting. With machines and installations the lens luminaire is an aid to direct quality control among other things.